The battle over the confirmation of Supreme Court nominee Brett Kavanaugh has spilled into California’s U.S. Senate race. Loyola Law School professor Jessica Levinson said de León is coming hard for Feinstein. 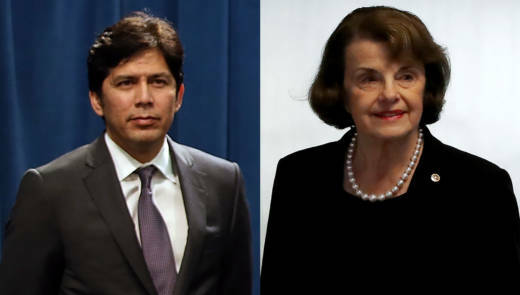 “It’s easy to be aggressive when you’re Sen. Kevin de León and you’re facing a huge uphill battle," she said. But at the same time, Levinson said de León must walk a fine line with his message. "(He’s trying to say) even though I’m running against a woman who’s been in the Senate for a long time and has been a trailblazer in many ways, she’s simply out of touch and she doesn’t get this and she didn’t handle these accusations correctly," Levinson said. But De León wasn’t immune to the #MeToo story. His one-time roommate, former state Sen. Tony Mendoza, resigned following sexual harassment allegations. And women criticized de León for not doing enough to prevent and deal with sexual harassment in the state Senate while he was leading the chamber. Samantha Corbin, who co-founded We Said Enough, which helped lead female activists calling out sexual harassment in the state Capitol, notes Feinstein kept the letter private at the request of its author, Christine Blasey Ford. "Even if Dianne Feinstein had come forward and said, 'I’m going to ignore the request of a woman who’s come forward, a constituent, who’s afraid, and rightfully so, and I’m going to release at least the facts of the story,' she would have, in essence, been outing Dr. Ford," Corbin said. De León’s campaign notes his statement made clear that Ford’s anonymity should have been protected. Steve Smith is a spokesman for the California Labor Federation, which is backing de León in the Senate race. While his group believes Feinstein acted thoughtfully in regard to the letter, Smith said they understand why de León is concerned about it. Regardless if this argument sticks or not, law professor Levinson said this is not something Feinstein wants to be dealing with right now. Those are questions de León will likely keep bringing up as he continues making his case to voters.